Whenever a series is named using Roman numerals, I always ask myself whether it will have the staying power to push forward into the uncomfortable area of 3+ installments. It is at this stage where the simple notion of using hash marks (I, II, III) for numbering takes a nasty turn and seldom-used letters such as V and X haphazardly appear and demand to be either added to or subtracted from regardless of the fact they are LETTERS, not numbers. It's disconcerting, and reminds me of my own damaging introduction to algebra where letters egregiously overstep their bounds and begin inserting themselves into mathematical equations as "variables." Challenges notwithstanding, there is no way to have only 3 knives. There are times when you want a design that makes few compromises when it comes to strength, but also doesn't have the mass and physical dimensions of a full-size Bowie or combat knife. In this big-but-not-too-big space, the White River Knife and Tool GTI 4.5 stands out. The blade length, as the name suggests, is 4.5" and putting a tape along the entire knife shows 9.75". Using a heavy choil and index finger carve-out in the sculpted micarta handle, you get a non-slip grip on the GTI regardless of conditions. The GTI's handle is a thing of beauty. G10 is also offered but there is not a handle on any knife that I like more than White River's micarta. Among the first things you notice about the GTI 4.5 is the thickness of the blade, which is a full 3/16" along its entire length. Steel is S35VN stainless (59 HRC), which is cryogenically tempered for increased durability. I don't know of a thicker S35VN blade on the market. 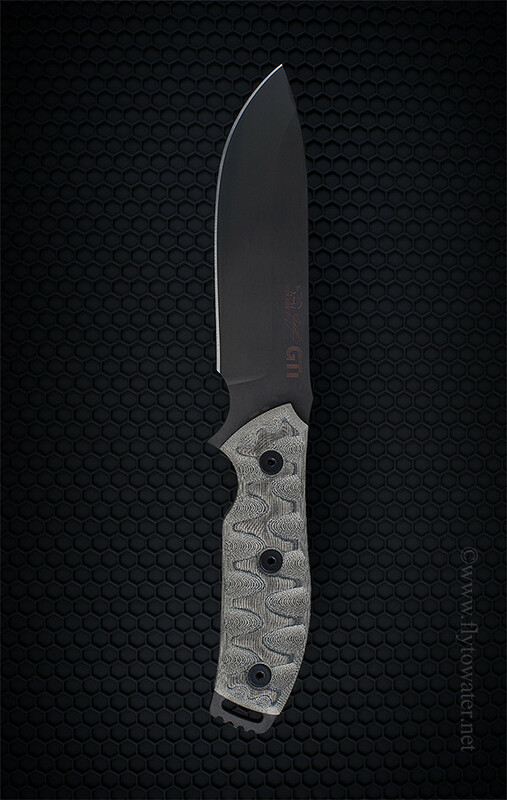 This is a Justin Gingrich design (former U.S. Army Ranger with a decade of active duty military service) and the intent was to create an ideal tactical knife for patrolling, demolitions, and close quarters combat. It's full-size utility in a medium-size form factor. Included is a leather sheath that simple and effective, being easily worn on a belt or strap as well as being MALICE clip compatible. The sheath does not achieve the greatness of the Winkler Belt Knife's, and I think White River could do a little better in the leatherwork department - but it's functional. Ultimately the bulk of the purchase price clearly goes toward the knife's materials and workmanship. See the sheath and knife HERE. White River Knife and Tool is a company to watch. I really like their little Scout, which was intended to be a caping knife but has been getting a lot of press as an all-around camp blade that is scalpel-sharp. They've become hard to find after winning some recent awards and getting featured by Field and Stream. The GTI 4.5 is another excellent option for those who want a tough working knife but also appreciate quality craftsmanship.